Lining up the Whitsundays again on GFS. Poor buggers can't catch a break. I think Daydream Island was just about to re-open too. He is a bit late to the party, but will amp it up now, for sure. That's 240 hours away..that's Monday of not next week but the week after. It's grain of salt sort of stuff especially when it comes to cyclones. It's never going to come back if it goes East too far, plus its all going to be down to whether that upper high develops in time or not. Going to be an interesting week, thats for Sure. Not holding my breath though. 2 invests for the two lows. 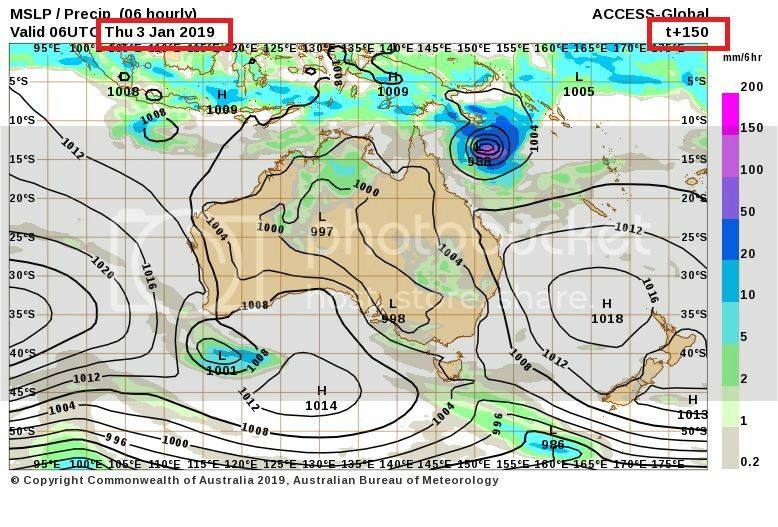 I wait for the day when an extended GFS run shows a system sliding SE away from the coast and someone responds with, "that's a long way out and it might still head to Cairns, Townsville etc"
Extended GFS seems only to be questioned when showing a hit. Any model at that range should be questioned especially when there's many different steering influences involved unlike a Yasi-type setup. That said, the latest EC curves it back into the coast as well but as usual, disclaimer - it's over a week away and many things can happen between now and then which can change that track. I am surprised facebook has not said it will hit Brisbane as category 9 cyclone. ACCESS g has the invest hovering at the tip of the peninsula for days . Sitting over land reducing quick intensification. The ridging extends well north and keeps the developing beast on hold well north at the tip. Is it possible to go from a~ cat 2 to a~ CAT 4/5 in 24hrs? 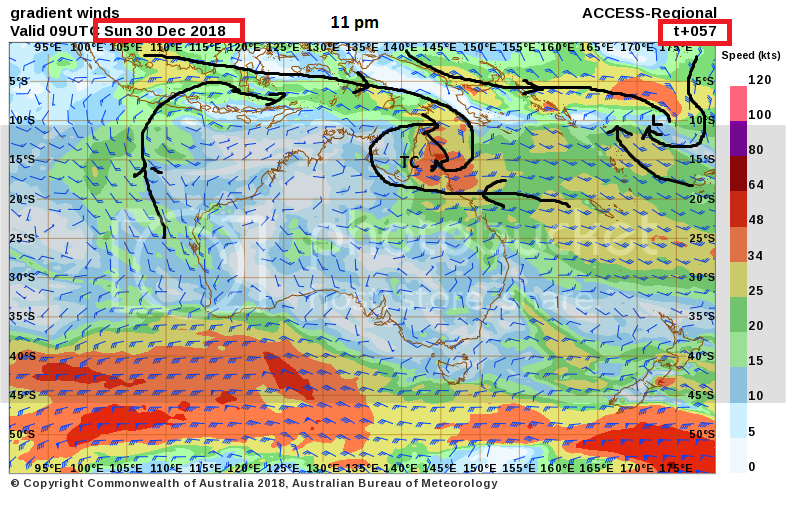 Here is a map of ACCESS 1km surface winds showing clearly the NW infeed and the southerly infeed. This wind map is sunday night 11pm. 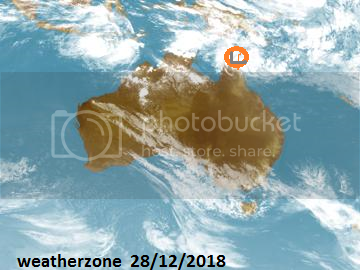 I reckon the BOM will name the cyclone before Monday. Perhaps sunday. I doubt the ACCESS wind stream legend is accurate . Just like the mslp is not accurate. But visually showing 4 quadrants ramping up. But l might check with the cyclone services one day , to see if ACCESSr does indeed forecast correct wind speed near the core. ACCESS r has the tropical low centred 146e 12s Just with( half on land and half at sea. Right at the east tip of peninsula. Yes ,EC has it hitting the Whitsundays. With TC Owen the models (and a certain storm chaser site) were certain it was going to destroy Sth East Qld when it was still a week out with uncanny agreement. Of course, it didn't eventuate. Sure - didn't Marcia do exactly that? "Thursday February 19th, saw tropical cyclone Marcia continue on a south-westerly track and undergo a period of extremely rapid intensification, increasing by two categories to a category 4 severe tropical cyclone in approximately 12 hours. This increase in intensity is well above the average rate of intensification for tropical cyclones anywhere in the world." The next name on the cyclone list is Penny. While many models have been jumping around a bit, the GFS FV3 has been consistent on coral sea for many days now. I think I posted back around 23 December that FV3 was trying for something. Overall though 10 days lead time is a long way ahead and anything about likely landfall location is quite speculative given the current quidge. Enjoy the watch, wait, or nothing whichever way it goes. Another small shift in position of INVEST by ACCESS this morning. Only a few hundred km east and the low is centred on the east coast of the cape . As soon as she hits sea. Boom! Takes off like a gas can thrown into a fire. Monday and Tuesday looking the worst for the far tip of the Peninsula as the intensifying TC remains for a few days. The Tasman high ridging continues into the week keeping the TC from transitioning south. What l find amazing is that the trough over Australia is still blocked by that tasman high some 6 days from now. Actually l find that hard to believe that that will happen. Looking at the updated Marine Wind Warning Summary from BOM, a gale warning has been issued for the Peninsula coast for tomorrow. I spoke to Levi and he said "when the FV3-GFS replaces the operational GFS in a couple months, the full suite of products will become available for all regions" . It looks like there is a Low centred somewhere near Lockhart River at the moment. EC's latest track is interesting. No dancing around out in the Coral Sea like the others are proposing. 7 registered (NotsohopefulPete, Farra, Sidney, Lee@Hazo, Vinnie, Snowmaker, bundybear), 58 Guests and 3 Spiders online.